The menu at Plan Check isn’t very crowded, but everything on it seems to have the benefit of a lot of thought. There’s nothing simple, and the southern fry is no exception. It’s nost just fried chicken, it’s jidori chicken, a particular type of breed known for strong flavor. Bacon would be a popular addition but it’s also a lazy choice, and it’s not the one made here. That’s duck breast ham you see pictured, and spicy green pimento cheese and pickles round things out. I’m generally skeptical of the upscaled sandwich—after all, there’s nothing wrong with a simple fried chicken sandwich—but there’s a clear vision at work here and I respect anyone who thinks that they can make something humble into something genuinely special. It’s a successful effort here, resulting in a delicious sandwich. 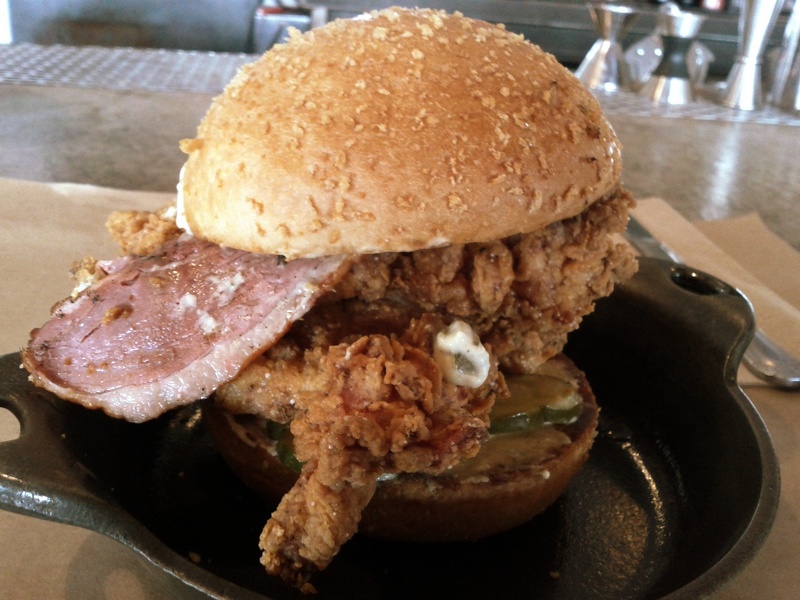 Exquisitely crunchy fried chicken with a strong, meaty flavor, plenty of heat, and a salty sourness from the pickles and the ham. It’s not Top 10 good, but it is well, well above average, and that’s always something worth celebrating. Truly one of my favorite sandwiches in the city, and on the westside it stands among the Bay Cities Caprese and the Attari Tongue as best in the area. I’ve sampled Bay City but not yet the caprese, I’ll have to rectify that. Also, no westside sandwich discussion is complete without Fundamental LA, a newcomer but a valuable one.